Reading caretaker manager Martin Kuhl has confirmed he will take charge of the first team for their Championship match against Preston on Saturday. 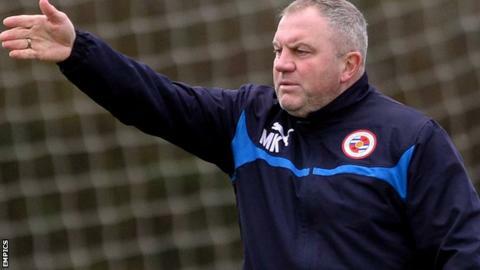 Under-21s manager Kuhl was placed in charge on an interim basis following Steve Clarke's dismissal on Friday. "I've been informed I'm taking charge of the team on Saturday," he told BBC Radio Berkshire. Former manager Brian McDermott is understood to have held talks about a potential return to the club. Kuhl, 50, a former Birmingham, Sheffield United and Portsmouth midfielder, has been with the club since 2011. "I'm on about my 74th page of (picking) a team at the moment," he said, ahead of the visit to Deepdale. "It's the business end. There's people travelling and paying money supporting the club and the players' have got to realise that. "We move on and the supporters stay here." Kuhl led Reading's under-21s to victory in the Premier League Cup in 2014 when they beat Manchester City in the final. A former assistant manager to Gary Waddock at Wycombe, he also had a brief caretaker spell in charge of Aldershot in 2007.